STAR TRACK is a FREE eight-week youth track cycling development program. 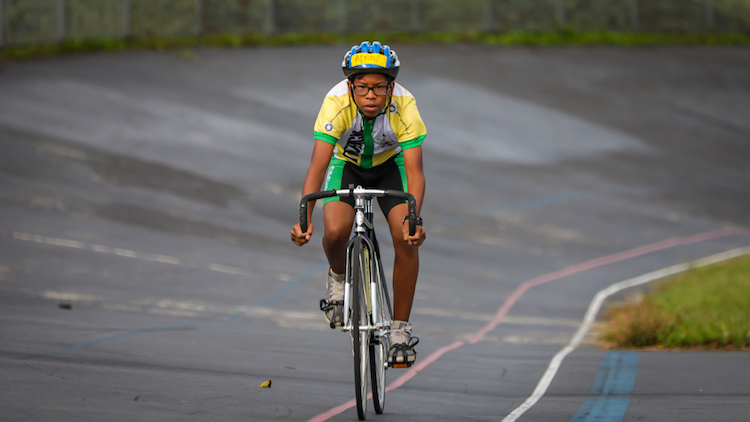 Training is held after-school weekdays and on Saturdays at Kissena Velodrome, located at the intersection of Booth Memorial Avenue and Parsons Boulevard in Flushing, New York. Star Track will teach your child the principles of bicycle riding and racing at the Velodrome's 400-meter banked oval track. Riders will learn sportsmanship and teamwork while enhancing his/her physical and psychological development. Emphasis on nutrition will be incorporated. Our 2019 spring session begins in April and runs for eight weeks. Classes are fee-free for riders, and Star Track provides all necessary equipment including bicycles and helmets. Beginner classes are Mondays and Wednesdays. Inquire about availability at info@startrack.nyc. Eligibility: Children ages 8-14 who are at least 53 inches in height are welcome to join. After your child is registered, we will email you a Release and Waiver form and a Parent Pledge form. Both forms must be completed and signed by a parent or guardian and brought to the first class. These forms are required for participation, no exceptions. Please be advised that this is not a "drop off" Program. All parents and guardians must remain on-site for the duration of the classes. Please note: There may be a waiting period before your child may register. Participants are required to have prior knowledge of how to ride a bicycle unassisted without the use of training wheels.